Our most common encounter with opossums is usually on the road. If you drive on a regular basis you have definitely seen a dead opossum that had been hit, or may have hit one yourself. Opossums are the only marsupial (pouched mammal) found in the US. They are hunters and will hunt mice, birds, insects, worms, snakes, and even chickens. When approached by a potential predator, they will often lay on their side and fake death until they have a chance to escape. They are mostly known for being scavengers. Opossums invade homes searching for trash or other food or water that is available for them to scavenge. If they find a place that has a good supply of food, they are likely to nest close by. The opossum in the picture above had done just that. It decided to move into the subarea of the customers house. 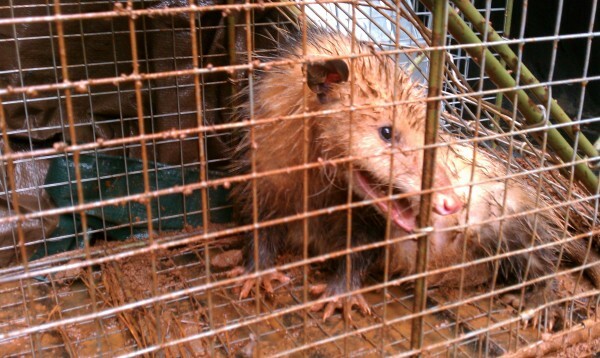 The customer called Gold Miner Pest Control and we were able to catch the opossum and quickly remove it from their home. If you are having a similar problem, definitely give us a call. Having opossums get into your trash is definitely a nuisance. They can also carry many types of diseases and parasites as well. Having a family of opossums create a nest near your home may mean that you don’t only end up with opossum problems, but with mites, fleas, ticks, and others as well. As you can see in the picture above, they aren’t the cleanest animals. Be sure to keep your trash in a protected area and make sure that pet food is not left out. The less there is to attract them, the less likely they will be to visit your home. Do you live in Colfax, CA and have a pest control problem? Give us a call or contact us for a quote! Pest Control Quote.